Last night’s episode of Keeping Up With The Kardashians showed Kris Jenner suffering from a food allergy which caused her upper lip to inflame during a family vacation in the Dominican Republic. It’s unclear exactly what caused the reaction and Kris Jenner has since revealed that she’s having tests to get to the bottom of it. The show began with Kris Jenner, 56, calling everyone in to look at her lip – a scene released by the E! Network in May before the seventh season of the reality series began. 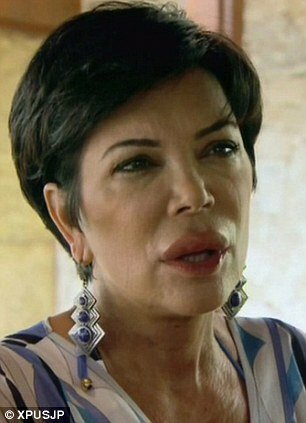 Despite speculation that Kris Jenner had collagen or a filler, a doctor confirmed it was an allergic reaction. “I’m a mess,” she complained. Bruce Jenner, still angry that Kris had been in contact with a former lover Todd Waterman on last week’s show, didn’t have much sympathy. “God is punishing her for giving Todd her email,” Bruce Jenner huffed. Later, Bruce and Kris Jenner surprised Scott Disick by taking his side in a spat with pregnant daughter, Kourtney Kardashian. At breakfast, talk quickly turns to the trouble Robert Kardashian and Scott Disick had been up to the night before. The bored pair had been drinking a little too much and broke into Kylie and Kendall’s room to play a prank. It was Kim Kardashian who ratted Scott Disick out to Kourtney about a particularly juvenile prank he had pulled. “Scott peed in a trash can,” Kim Kardashian said. A livid Kourtney Kardashian stormed back to her room to shake awake the hungover Scott Disick to tell him to join the family at breakfast. “Scott is being so selfish,” Kourtney Kardashian, who’s pregnant with the couple’s second child, tells the camera. But Scott Disick said he is weary of being picked on for everything he does. “I don’t even want to be on these stupid f***ing family trips. I feel like I’m just done,” he said, storming away from the table. Robert blamed Kim for causing the spat. “Kim needs to keep her mouth shut,” he told the camera. Nonetheless, Bruce Jenner said he wasn’t keen how Scott Disick stormed away from the table, something he often does, and went to confront him. Playing amateur therapists, Bruce and Kris Jenner quickly realize what’s been eating Scott Disick – he doesn’t feel a part of the family. “Maybe I’m a little too sensitive sometimes,” Scott Disick confided to Bruce. Scott Disick reminds the family that Kourtney said she would marry him after she got pregnant the second time. She has since changed her mind. Bruce and Kris Jenner then decide to have a heart-to-heart with Kourtney. “He’s been in the family six years and he never feels quite worthy,” the former Olympian said. Meanwhile, Kendall and Kylie Jenner persuade Kim Kardashian and the rest of the family to be in their music video. Kim Kardashian shakes her curvaceous booty, poured into a tight red bikini bottom, in the pool. As for Kourtney Kardashian, she sees the error of her ways and buys Scott a love bracelet. “You’re not disposable and I don’t want you to feel that way,” she tells him.